What a rare find! Two open concept timber framed homes & massive protected views to Mt. Mansfield & the Green Mountains of Vermont! Open wonderful acreage including a 30' X 36' barn with horse stalls, shed, fenced paddocks. Be sure to watch our video! The timber framed main house has a center staircase to three floors of fun! Brand New state-of-the-art custom maple kitchen opens to dining & living areas. The New Master suite offers a private getaway space. The third floor is perfect for workout room, studio or fun kids getaway space. The flexibility on this home is terrific. A finished area over the garage with bath & private stairs is perfect for teenagers. The "big bonus" is the one level 1,200 sq foot timber framed Guest House built in 2001 ready for the in-laws or Air B & B! The warmth of wood is wonderful in these two timber framed homes. Check out these smart elements to the guest house: efficiently designed kitchen with granite counters, open concept living room with cathedral ceilings, office space, one bedroom that could be expanded, built-ins with custom gas stove,3/4 bath with laundry, wall of windows to the deck, & full basement ready to be finished. This home has been loved and cherished by the family and it shows. An easy drive to shopping 10 minutes away and 20 minutes to downtown Burlington! Close to skiing and trails - a true Vermont experience and priced below 2018 Appraisal! 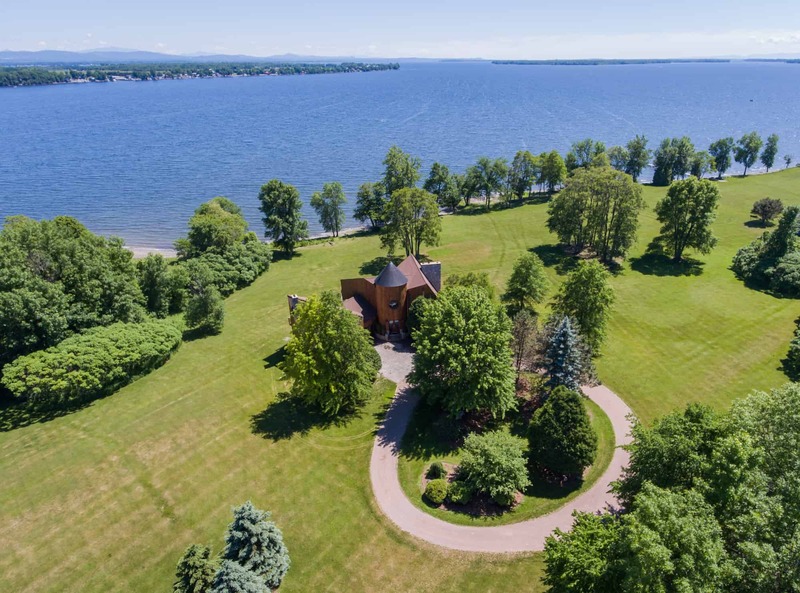 A rare and inspirational view of Lake Champlain from this 5 acre architect designed cape style home renovated with style and appreciation for the view. The High Peaks of the Adirondacks serve as the backdrop to a 180 degree view of Lake Champlain. Large high quality energy efficient windows allow the panoramic lake and mountain views to be part of the interior. ALL NEW kitchen with radiant floor heat, hardwood flooring, NEW bathrooms with custom tiles, Buderus Furnace and heating system. New two car detached garage and much more. A smart price for high quality renovations and one of the most magnificent Vermont views! Need an inspirational world to live in? 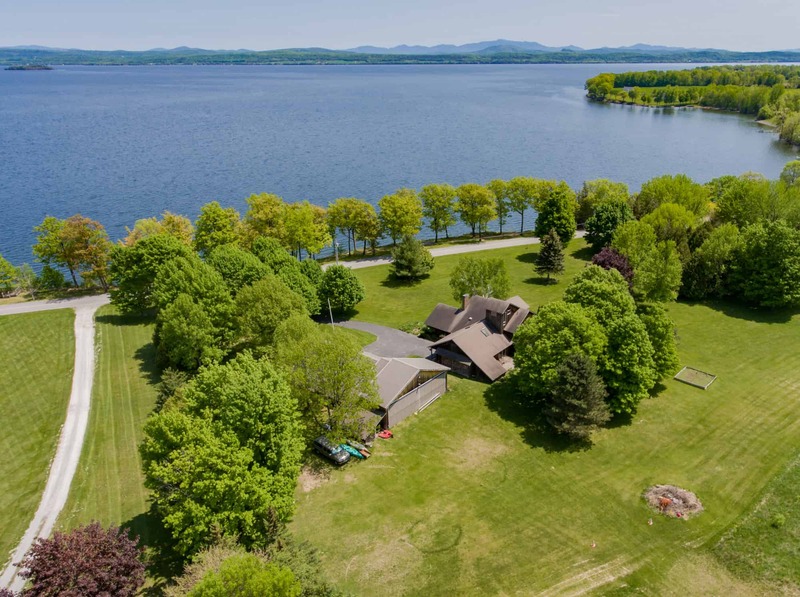 This 10 acre private setting on Lake Champlain is the answer. Sun drenched rolling lawn to 500 feet of direct easy access lakefront is a rare commodity on the lake. The beach is terrific for swimming, kayaking and docks for boating. The southeast exposure is stunning with views that go on forever. The west sun in the evening on this land is serene and beautiful. Be sure to watch the video online!.McGregor Point is a private enclave on a broad section of Lake Champlain only 45 minutes to Burlington Vermont. The owners have taken pride in enhancing the property with quality architectural details. The great room has a wall of glass to the view and an open floor plan to the kitchen. Warm wood trim finishes add to the mix of handsome stone/granite fireplaces, tiles & wood flooring throughout the home. The first floor master suite is complete with a custom built loft/office and spa bathroom. Porch with hot tub opens to expansive mahogany deck facing the views. Two additional bedrooms are upstairs with private balcony, bath and open hallway with overlook to lake views! A full walk out lower level with full floor to ceiling windows facing the lake has a family room with fireplace, bar, bath and two rooms. The newer built attached 3 car garage has a perfect space above to finish as a guest area or in-law suite. The radiant floor heat and central air conditioning was designed per smart energy audit. Vermont lake living at it's best! Renovated in 2016 this historic village home with western views is a cherished family heirloom. One of the original homes in Charlotte, this home was loved by 7 generations. Views to the Adirondacks & rolling sunny land to a picturesque pond make this a nice setting in the village. The renovations are terrific with original restored antique wide pine floors,New Kitchen with exposed beam ceiling & recycled stone counters,vintage ice box,New windows & siding,New insulation,New heating system,New Master bedroom suite with radiant floor bathroom mat heat,New Bathroom on first floor with walk-in shower & original claw foot tub,New updated electrical & plumbing,New laundry room,closets & porches + south facing sun room! Out buildings include the "old store"that would be a great studio/large garage, vintage brick smoke house & windmill! The apartment renovated in the 1990's is a plus! Walk to the village & minutes to Lake Champlain & the Town Beach. The family's greatest hope is the new owner will enjoy the tradition of love & joy within "The Old Homestead's" halls! Featured in a weekly column for the New York Times real estate section called "What You Can Get" which showcases properties all across USA. This VT Getaway home with 98 pristine acres, Only 45 minutes to Burlington Vermont! This home is hand crafted by wonderful local carpenters & artisans. Solid timber frame construction with new tech insulation qualities, energy efficient wall mounted furnace and hot water with radiant floor heat! Cherry custom kitchen w/ mahogany accents, fir floors, Fischer Paykel gas downdraft cooktop, Bosch wall oven, stainless refrigerator and drawer dishwasher plus built in beer tap/ cooler to enjoy those Vermont Micro Brews! There is a 3 bedroom engineered septic system. Master bedroom has a sleeping loft & there is a small room with futon next to the master bedroom. We list the property as 3 bedrooms for this reason & the septic capacity. Workshop area & wine closet in lower level. It is all about the Vermont landscape and views from this property. The front porch looks over the Champlain Valley to Lake Champlain. Views north to Montreal, incredible southeast views to Mt. Mansfield. With more clearing there could be a 360 degree view. A forester has been on site and can assist with view cutting. Custom rose granite walkway, hand forged railing, potting shed, standing seam roof with copper flashing and more! Perfect retreat to get away from politics and rid yourself of stress! Fairfield is a proud Vermont town protecting itself from development. Built in 1847, this classic VT farmhouse, on .92 acres boasts south facing sunny land with perennials & established garden space in Historic downtown Williston Village-walking distance to the community library, village park & in close proximity to I-89, schools, shopping and restaurants. The home has potential but needs repairs. The current owner has completed many updates that are listed in a Home Improvements Document attached to the listing. However, there are repair and upgrades needed including; roof repair, kitchen redo, foundation restoration & wet basement elimination.While there is plenty of Historic charm, the home needs the next level of updates & is being sold As Is. This home has potential & the market value,once upgraded, can support a $400,000 value.A bright 3 season entry porch opens to an eat-in kitchen with a Viking stove. The laundry room is convenient to the kitchen and a back porch has extra storage and includes a new energy 96% efficient boiler. An open,updated living room with classic custom built-in shelves/cabinets,a gas fireplace & a bonus room off the dining room completes the main floor layout.Wide board pine floors are refurbished & solid wood doors have been built to suit the age of the house.2 upstairs bedrooms with ceiling fans are restored & an extra room awaits your finishing touches.The detached,over-sized garage with a newer roof and board and batten siding provides ample parking & storage. Transform this home and unlock its potential! Lakefront Building Lot on Lake Champlain! Easy access sandy beach! The owner has site plan and State of Vermont Waste Water Permit for a 3 bedroom year round home. Only 15 minutes to downtown Burlington and the site is near the Colchester Bike Path. This area on the lake is experiencing new construction as exampled by the new home built to the east from this site. Three levels are allowed and the site is ready to go needing a Building Permit from the Town of Colchester. The home must be built by 2022 per the Town of Colchester. This building lot is part of a Condominium called Shoreline Condominiums. There are 5 other lots or cottages within the Shoreline Condominium project. The homeowner will own the land beneath the structure and be responsible for the land around the building. The only Shoreline Condo expense is a liability insurance cost to each homeowner of $145.92 annual. Condo docs, survey, tax map, and many other documents are available to review.